The Great Commission without the Church? Inconceivable. Many Christian ministries are driven by a single eyed focus on Jesus’ final words (Matthew 28:19, 20). These words have been sloganized as ‘The Great Commission’ to impel an urgent evangelistic effort to find and develop committed followers of Jesus Christ. This would be admirable if this common use did not eviscerate the heart of this commission by eliminating the place of the local church. This commission is fulfilled, it is felt, when the new disciple begins to make and teach other new disciples. But it is not. Jesus’ Jewish followers would have heard this in covenantal terms, as should we. In their heritage, when someone from ‘the nations’, not born a Jew, came to faith in Yahweh, his verbal expression of that faith was not enough to mark him as a follower of Yahweh. He could claim faith and live righteously, but he would not be admitted into the life of the followers of Yahweh apart from receiving circumcision, the mark of covenantal inclusion (see Exodus 12:48). Then and then only would he be considered a follower, a disciple, of God. The only change in the minds of Jesus’ listeners would have been the nature of the mark. Circumcision is now baptism (a subject for another day). Baptism marks a person’s being included among the followers of Jesus. By this act one is marked as belonging to God, as having been admitted to the community of faith, to the church of the living God. This step is integral to genuine discipleship and cannot be omitted from our understanding of it. We have not fulfilled the call of the commission if we do not lead Christ’s converts to Christ’s church. Groups operating outside the context of the church do wonderful things, but they cannot fulfill the great commission. Any work that fails to establish as its center the act of discipling converts into the church is not being obedient to the final words of Jesus. My son’s Marine recruiter hung with him long after my son had signed his commitment papers. 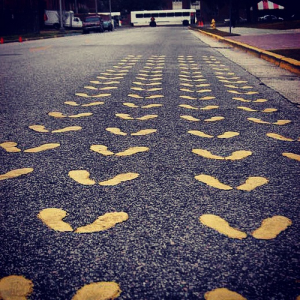 I later was told that Marine recruiters don’t get credit for the recruit until he steps onto the yellow footprints at Parris Island. Only then has he fully discipled his charge. Only then has he fulfilled his commission.